Do you need a representative for service in Canada? 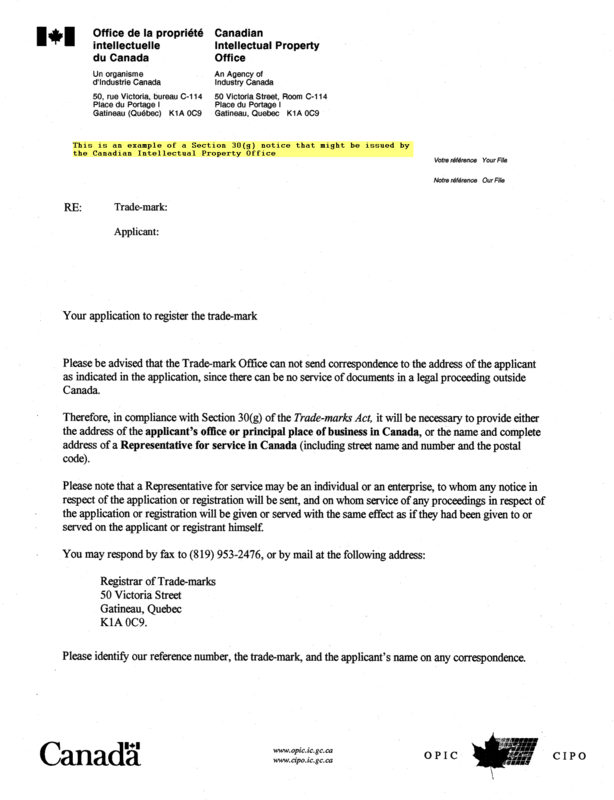 Trademark owners based outside of Canada must provide an address in Canada to which the Canadian Intellectual Property Office (CIPO) may send correspondence relating to the trademark application for registration. You will receive a Section 30(g) notice if your trademark application did not include an address in Canada to which CIPO can send correspondence. Here is an example of what a Section 30(g) notice looks like. The Applicant would be responsible for corresponding directly with CIPO for responding to Examiner’s reports (office actions), declaring use of the trade-mark in Canada and paying the government registration fee. Copies of any submissions made to CIPO should be also be sent to us to ensure our files are current and for tracking the progress of the application. Of course, we are here to assist you with any part of the application process or you can hire us to take a more active role in advancing your application to registration. If you are ready to proceed, please use this online form to send us the application details and submit payment for this services.